Jumping up on people is an attention-seeking behavior. 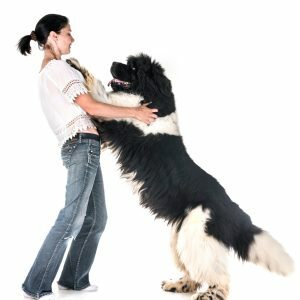 So telling your dog, “no jumping” is actually reinforcing the behavior because… you’re giving the dog attention by speaking to him or grabbing his collar to pull him down. If your dog jumps up on you and your family, everyone should turn their back and completely ignore him. If he continues to jump, leave the room (duck behind the bathroom door). Be careful not to look at him, talk to him, or touch him! But he may surprise you by walking away from you fairly quickly. Once he does that, life goes back to normal. IF everyone is 100% consistent in ignoring the dog for jumping, this behavior will eventually extinguish. Remember that jumping has become a habit! Be patient. Make initial greetings a non-event. Say hello and continue walking through the house. Take your coat off, change your clothes, and then come back to your dog. He should have calmed down by then. If his attempts to jump up stop, go back to your normal interactions with him. When visitors enter your home, make sure to leash up your dog FIRST. Your dog should be right by your side. Your leash is your best friend. It is a tool that gives you immediate control of your dog. You ask your dog to sit. Some people allow others to give their dog obedience commands. But that’s YOUR job. You are in charge, right? Have the visitor repeat her approach slowly. If your dog remains in his sit, give him a really tasty treat as a reward. You can also give your visitor a treat to give to reward him. Give lots of calm praise also. WARNING: if you take his leash off at this point and have your visitor walk with you through the house, your dog will jump on her! Keep the leash on your dog and keep him with you for however long it takes for him to settle and calm down. Once he’s calm, take his leash off and let him go sniff your visitor. Make all greetings by you and your family, and all visitors a non-event. Greeters should not pet the dog. Greeters should not stare at the dog. Greeters should not reach over the dog’s head to pet him. Your dog MUST SIT before being greeted by anyone. The calmer people are during a greeting, the calmer your dog will learn to be when greeting people. This entry was posted in Uncategorized on January 13, 2019 by renee.